The originality of this book, which deals with such a new subject matter, lies in the application of methods and concepts never used before – such as ontologies and taxonomies, as well as thesauri - to the ordering of knowledge based on primary information. 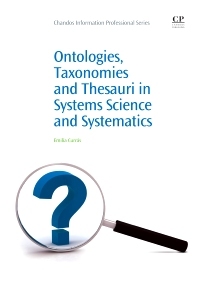 Chapters in the book also examine the study of ontologies, taxonomies and thesauri from the perspective of systematics and general systems theory. Ontologies, Taxonomies and Thesauri in Systems Science and Systematics will be extremely useful to those operating within the network of related fields, which includes documentation and information science. Dr. Emilia Currás is University Professor, researcher and an academic with a PhD. in Chemistry and LIS Certifications. She is owner of several honours, such as Fellow of Institute for Information Scientist; Decorated of Colombian Government; Prof. Kaula Gold Medal; Distinguished Woman from IBI (UK); Founder of SEDIC (Spanish Society for Information Science); ISKO-Spain Honorary President. She is an international lecturer, with invitations from Asian, American, European and Middle Eastern countries.